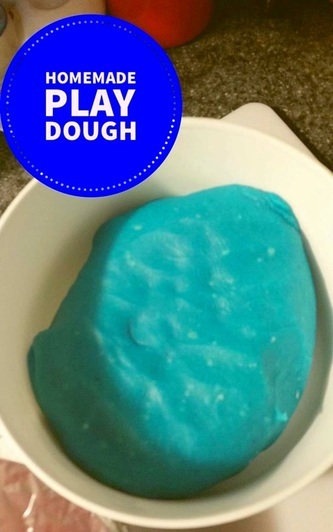 I would like to share with you what I think is the BEST play dough recipe!! I got it from my sister-in-law when she ran a daycare. It lasts forever! I made it for the first time a few years ago when I was looking after two little girls. I made two batches in two different colours and stored them in a resealable freezer bag in a gallon size ice-cream bucket. During one of our moves, it somehow got packed into a large trunk of stuff. I didn't find it until six months later and it was still soft and pliable as the day I made it. I have made it for other little ones over the years-and now it's time to make it for my own grandbabies. Boil 2 cups water and 1/2 cup of salt together. Stir in 2 cups flour, 2 tbsp oil, 1 tbsp cream of tartar and food colouring. When barely touchable, knead until a smooth workable texture is attained. Store in a large margarine container.